This armor will fit armor pockets in most late model apparel. If you want to check the fit, I suggest you turn the jacket or pants inside out and measure the armor pockets when laid flat, then compare the pocket size to the measurements of the armor. This type armor can be trimmed with heavy duty scissors but I wouldn’t recommend it since it only cuts easily in the molded “valleys” (see the close-up pictures). This armor is a molded rubber armor (sometimes called “turtle shell” type armor) that is soft and comfortable. 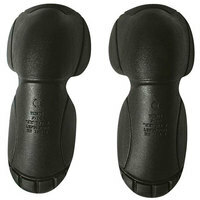 It offers CE approval and will fit in armor pockets in most jackets, pants and suits. Use the measurements above to help you judge whether the armor will fit in a pocket of a particular size. Consider this an upgrade to dual density type armor. One advantage to this armor in a retrofit situation as compared with GP type armor is that it’s possible to trim these armor pieces to fit a particular armor pocket size (see my sizing comments above).